Chameleons spend most of their lives in bushes or trees, where they can hide from predators and wait for food. They’re unique among lizards because they have zygodactylous toes, meaning their feet can grip tree trunks and limbs. Their prehensile tails also wrap around branches to anchor them as they hunt, rest and eat. Hatchlings and adult chameleons eat essentially the same foods, although older and larger animals can consume bigger prey. Common meals include cockroaches, crickets, grasshoppers, stick insects and other bugs, as well as spiders. In some of the biggest species, such as Meller’s chameleon, which can grow to nearly two feet, adults even dine on their fellow lizards, small birds and, in captivity, baby mice. A few species supplement their insect diet with flowers and leaves; for example, veiled chameleons, which live in deserts, absorb water by eating plants. To help them spot prey, chameleons possess eyes that can operate separately from each other and swivel around, providing a 360-degree view. This enables the chameleons to track insects and other small animals while remaining nearly motionless. When they’re ready to strike, they turn both eyes on the prey so they can gauge depth and distance accurately. 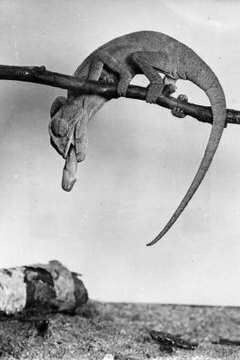 Chameleons catch dinner using their sticky tongues, which can be as long or even longer than their bodies, depending on the species. A chameleon’s tongue can whip out at a speed reaching 1640 feet per second. Once it fastens to prey, the tip of the tongue serves as a suction cup, pulling the food into the chameleon’s mouth. The lizard then grinds the meal between its jaws.